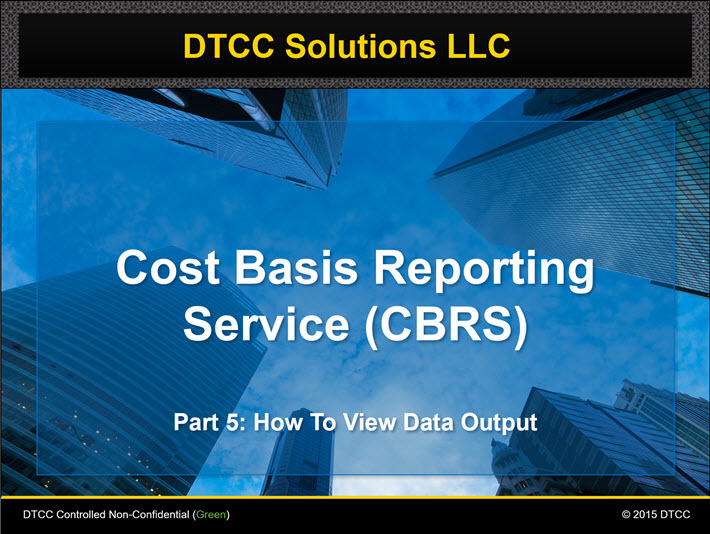 Familiarize yourself with the Cost Basis Reporting Service (CBRS) features by logging in to the Learning Center and accessing the content in this section. 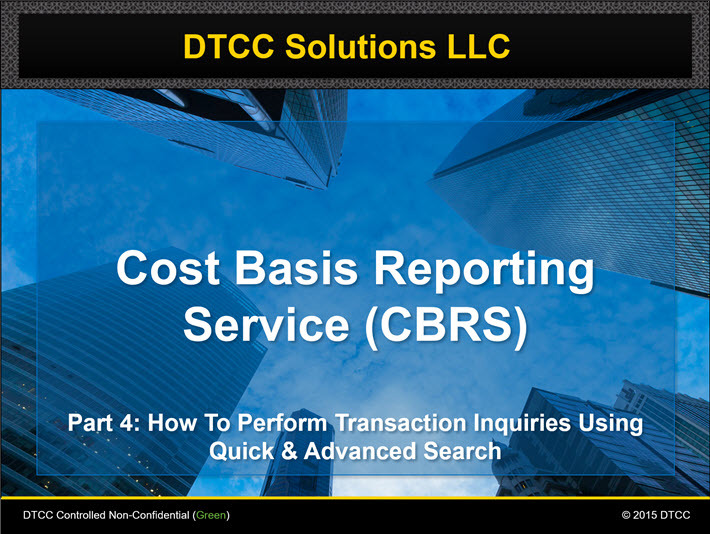 The Cost Basis Reporting Service (CBRS) mitigates potential endless paper trails, added costs and added operational risk associated with firms manually transferring their cost basis information. The previous version of CBRS allowed financial firms to pass customer cost basis information on assets transferred through the National Securities Clearing Corporation (NSCC)'s Automated Customer Account Transfer Service (ACATS). 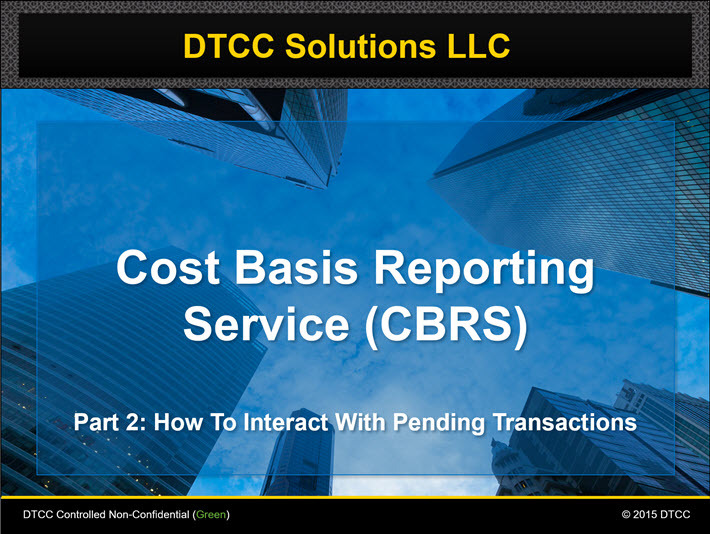 The enhanced CBRS service extends its efficiencies and capabilities to transfer agents, issuers, mutual funds, custodian banks, and broker/dealers to move cost basis information from one financial firm to another on all assets. 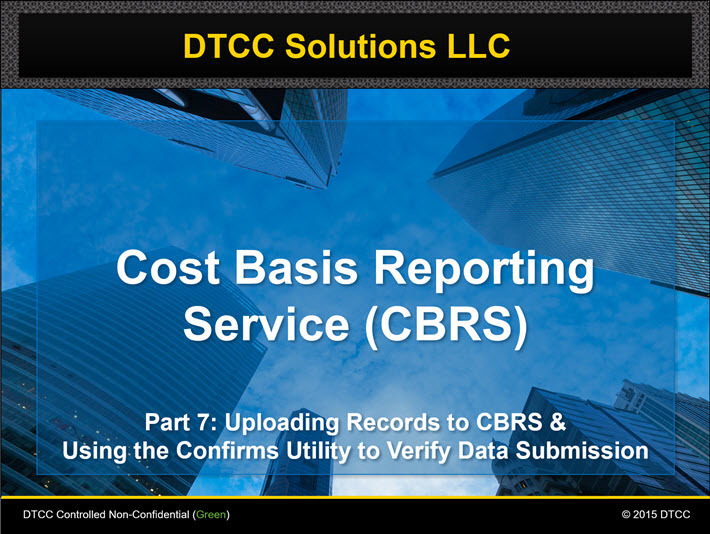 Login to the Learning Center, and then expand the sections below to learn about CBRS Input Information Flow, Content Types for Input Records, how Asset & Tax Lot Records Form a Package, and basics CBRS Processing. For training about Using CBRS, watch the webcasts available in the CBRS Overview and CBRS Procedures. You can also view CBRS documenst and download the CBRS User Guide, and record layouts. Watch the CBRS Overview webcasts that explain how to perform important CBRS functions. Access the CBRS User Guide v 7.0 to understand the CBRS process flow, view business processes, understand the application input and output, and evaluate the best practices. View CBRS Documentation, which includes important notices, CBRS user guides, CBRS record layouts. Use the Manual Transfer Statement to pass cost basis information in a standardized format. Log in to view ACATS content in the Learning Center.